In the past decade, the Australian migrant population has raised by an extra 1.7 million. 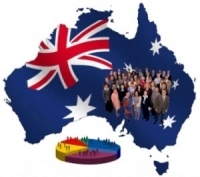 The figures from Australian Bureau of Statistics (ABS) show that at present, the foreign-born population amounts to more than one-fourth of the total population of Australia. Neil Scott, ABS’ Assistant director of demography says that the last time migration levels were this high was prior to World War II. He stated that over the recent years, roughly around 60 per cent of population growth in Australia is coming from overseas, whereas around 40 per cent is from the birth of young Australians. With over one-third of its population born out-of-country, Western Australia has the largest proportion of immigrants. Neill Scott says all the territories and states of Australia have recorded growth. He added that while comparing the earlier census in 2006 to 2011 data, essentially an increase for all the territories and states can be seen. Mr. Scott said that in terms of the number of foreign-born people as a proportion of their populations, no state or territory has dropped. He says many migrants are careful about the territory or state they select to live in and added that though the number of immigrants coming from the UK is slowing, the numbers from India, China and New Zealand are increasing. Looking at particular territories or states and the immigrant population in them, India comes second in the state of Victoria. This shows how Indian immigrants contribute to the population growth of Victoria in particular and Australia in general. The ABS says that several people migrate to Australia on temporary visas like 457 or student visas. Migration Institute of Australia’s (MIA) Angela Chan says skilled foreign workers who are willing to migrate for work will move to a country where jobs are available. She adds that foreign-workers sponsored under the 457 regime, are very much protected as sponsors have to go through a detailed process prior to sponsoring any workers. Dr Bob Birrell says a fraction of these migrants go on to live for a long-term in Australia. He says this is boosting growth in some immigrant communities in cities like Melbourne and Sydney. He adds that the significant part about these numbers is they show that Victoria and New South Wales continue to be the primary settlement points for immigrants, but predominantly for Asians, which reflects that, many of the migrants come here as temporary residents, especially students, and afterwards go on to obtain residence or other visas which allow them to stay.